Mental Health Safe Space is a training and a movement. This training is focused on eliminating the stigma that surrounds mental illness, so that individuals and families can get the help and support they need. 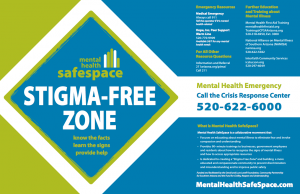 Mental Health Safe Space provides FREE 90-minute trainings to businesses, organizations, government employees, and residents with a focus on downtown Tucson. This project was created by the Mental Illness Stigma Elimination Task Force, a partnership between the Community Partners, Inc (CPI) and the Fund for Civility, Respect and Understanding. This project is funded by the Fund for Civility, Respect and Understanding, the Lovell Foundation and CPI.